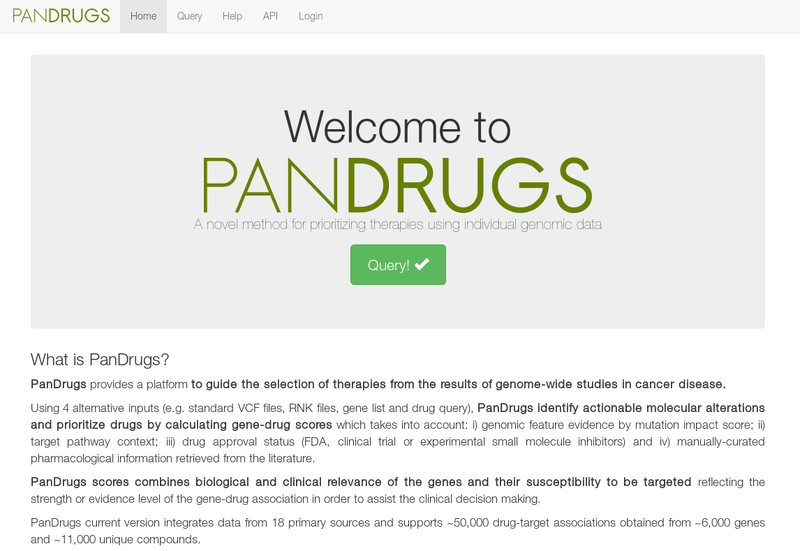 PanDrugs provides a platform to guide the selection of therapies from the results of genome-wide studies in cancer disease. Using 4 alternative inputs (e.g. 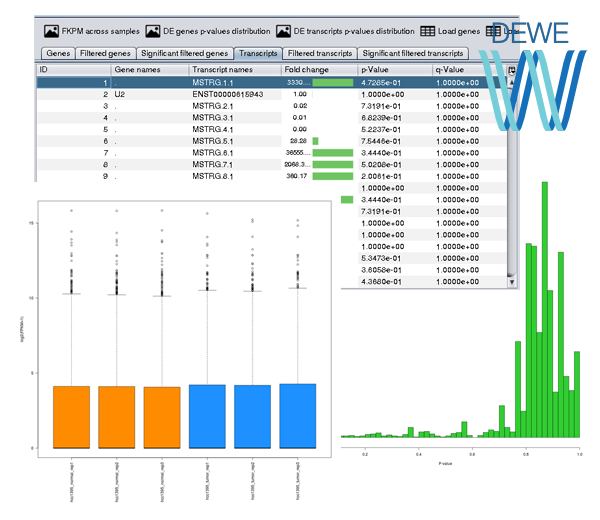 standard VCF files, RNK files, gene list and drug query), PanDrugs identify actionable molecular alterations and prioritize drugs by calculating gene-drug scores which takes into account: i) genomic feature evidence by mutation impact score; ii) target pathway context; iii) drug approval status (FDA, clinical trial or experimental small molecule inhibitors) and iv) manually-curated pharmacological information retrieved from the literature. PanDrugs scores combines biological and clinical relevance of the genes and their susceptibility to be targeted reflecting the strength or evidence level of the gene-drug association in order to assist the clinical decision making. 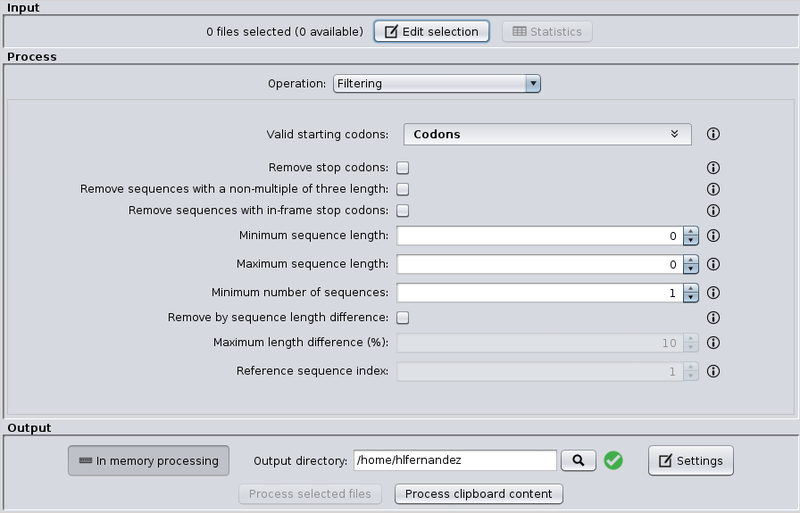 Filter sequences based on different criteria (including text patterns). Translate nucleic acid sequences into amino acid sequences. Sort, merge, split or reformat files. 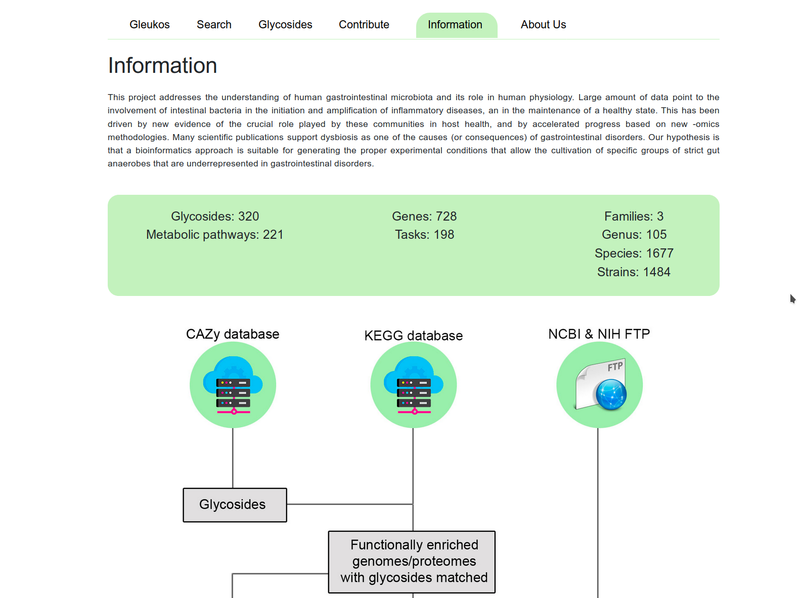 Gleukos is a new public Web-based resource that aims to provide a comprehensive portrait of the glycolytic abilities of bacteria, in articular those encrypted in the protein complement of the human microbiome. This project addresses the understanding of human gastrointestinal microbiota and its role in human physiology. Large amount of data point to the involvement of intestinal bacteria in the initiation and amplification of inflammatory diseases, an in the maintenance of a healthy state. This has been driven by new evidence of the crucial role played by these communities in host health, and by accelerated progress based on new -omics methodologies. Many scientific publications support dysbiosis as one of the causes (or consequences) of gastrointestinal disorders. Our hypothesis is that a bioinformatics approach is suitable for generating the proper experimental conditions that allow the cultivation of specific groups of strict gut anaerobes that are underrepresented in gastrointestinal disorders.